As I'm not growing quite as much this year I've decided to dispense with growing potatoes, which I can buy locally for next to nothing anyway (although I do admit they're very satisfying to grow). In there place I've decided to stick with the nightshades (solanaceae) though so it doesn't mess up my rotation plan. I've also trying to be a little smarter with my gardening and trying to reduce labour. I've decided to take a leaf out of Curtis Stones book and plant my plants through weed membrane. The idea being that I won't have to weed the plot & it should retain a lot of it's water as well. 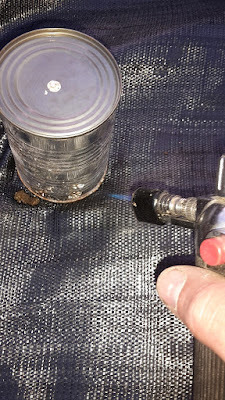 I've tried to use weed membrane like this before but it's never really worked for me because it starts to unweave as soon as you cut the holes for the plants. Reading a few books and blogs apparently burning holes into the fabric is the way to go as it seals the edges. I will also be able to reuse this year after year as well. 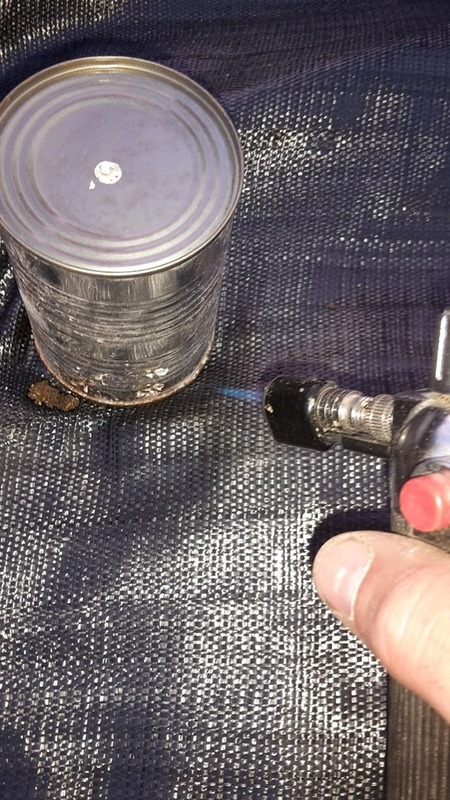 I used an old bean can to burn around for the tomatoes to go into. This is proper recycling as this was the same can I used to measure sheep feed with! I'm planting these tomatoes very close together as well. The plan is that I'll have these 50 or so plants in a 10ft by 4ft bed but each plant is only allowed to set one truss of fruit. It then gets pruned so all it's energy goes into that first truss. I get a lower yield per plant but because I can fit so many more in I should still make good use of the bed and each truss would be of good quality and ripen faster. 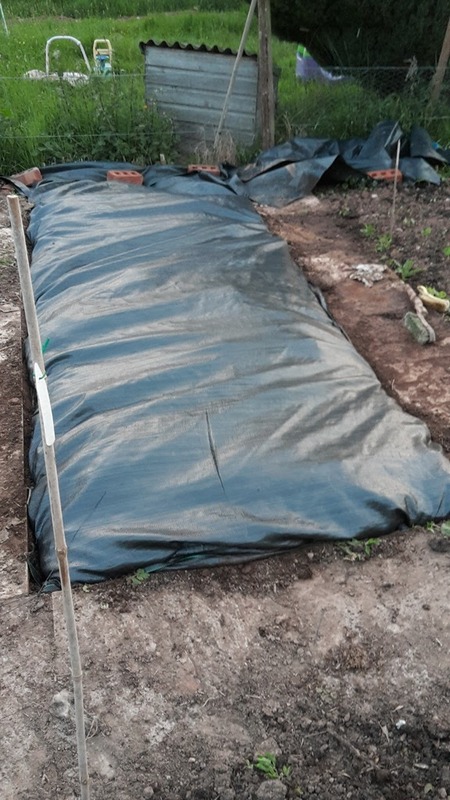 The bed is split into two with larger plants at the back and younger, smaller plants at the front, this should give me two flushes of fruit from this bed. There's also a huge mix of varieties (nine or ten I think) so I can see which ones do well under this system. Anyone else planting tomatoes outside? Who else has tried a system like this? Hopefully it'll produce a glut I can preserve by canning! It will be interesting to see how this all works out, seems a shame just to set one truss though, one lot of my tomatoes has already set and swelling more every day. I have some set in the greenhouse already. 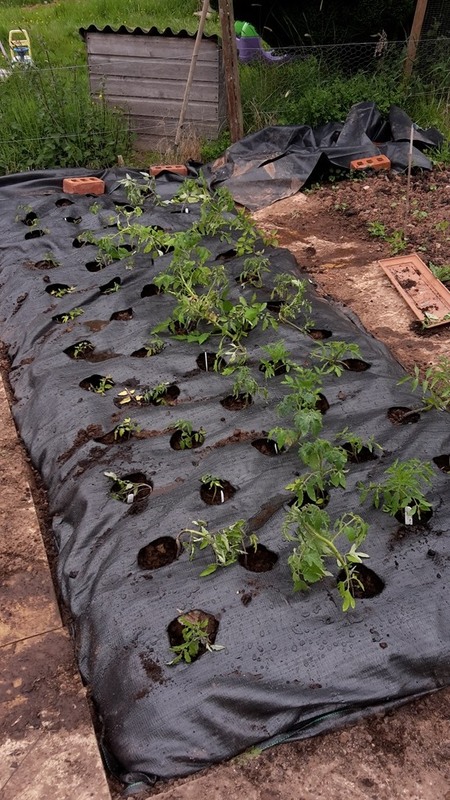 This is just a way of getting an extra hit of tomatoes and trying to avoid blight. I can't grow full sized tomatoes up here in our particular location in northern Minnesota because we don't have enough heat or long enough season. Some day when we have a very big hoop house over part of the garden . . . I'll be very curious to read updates on this tomato experiment. Will the plants still prosper pruned back to just the one truss? Apparently, from what I've read they'll do really well and that one truss of fruit will be ready much quicker than if it was growing many trusses. I struggle with big tomatoes sometimes so I'm hoping this might be a solution. Just put a few plants out this year.Usually I do 100 or more trellised up for the Summer but the fence project focus is taking up all my time for now. Once it's done back to growing stuff and taking better care of my bees. I have a few projects on the go this year so I've reduced my growing area. To be honest I think this plastic mulch is the way to go as it means I can plant things and not have to weed as much which is what kills me here. Also I should be able to reuse it many times over. Mine have all been planted out for over a month, and are already about 3 ft high with several trusses formed. Even so, it'll be quite a while before I have edible fruit. My greenhosue ones are looking good and have some flowers and a couple of fruits formed. These outside ones have no flowers yet but it won;t be long until they're established. It will be interesting to see how they do, I'll be watching with interest. Brilliant idea to heat seal the edges of your holes this way. 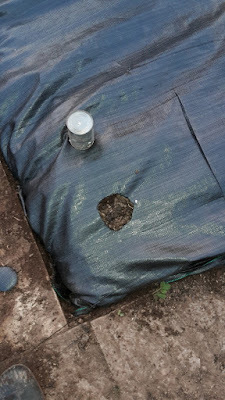 We used weed membrane to cover our outside beds over Winter the first year we had them and we are still picking long strands of plastic stuff out of the soil. 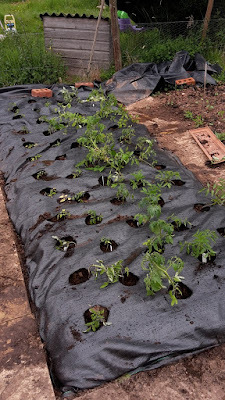 I don't fancy heat sealing all the edges though so we are switching to thick blank polythene this year. My best ever crop of outside tomatoes were some that I totally forgot about. They didn't even get staked, they simply sprawled all over the raised bed and got half covered in weeds. They were the sweetest tasting tomatoes ever. I think sealing this stuff is the best way to use it. I have some from years ago as well and I'm still dealing with the mess. I think the key is also to take it up as soon as it;s not in use and to store it properly. Very clever Kev, I'll be fascinated to see how it all goes. Not really my idea but it's something worth trying to see it it'll work here or not.